Hastinapur is certainly not an unfamiliar name to a reader of Indian mythology, as it is described as the glittering, glorious and powerful capital of the Kaurava clan in the epic Mahabharata. However, the first references to the location of Hastinapur comes as the capital of Emperor Bharata, the mythical king and ruler of the Chandravanshi (lunar dynasty) lineage from whom our country derives its name ‘Bharatvarsha’ or ‘Bharat’. Before we trace the origins of Hastinapur, for better understanding of the context, let us briefly understand the Chandravanshi lineage of kings, where-from the Kuru clan emerged. The Chandravanshi (Lunar dynasty) commenced with Pururava, who was the son of Budh and Ila (daughter of Manu) and came down through his eldest son Ayu. The fourth King in this lineage was Puru, younger son of King Yayati (a.k.a Jajati) who pleased his father by taking on his old age upon himself and was in return blessed with the privilege of carrying forward the royal lineage of the Lunar dynasty, despite being the younger son. It is in the line of Puru, that the Kauravas and Pandavas descend (jointly called the Pauravas after Puru’s name), while the Yadavas (Lord Krishna’s lineage) descend from King Yayati’s elder son, Yadu (thus Krishna’s lineage is called the Yadu-vansha). However, it is important to note that though this city was the capital of King Bharata’s empire, it had not yet acquired the name of Hastinapur at that time. It was four royal generations after Bharata that his descendant King Hasti accentuated the capital and built a royal city on it: one that was equally powerful and fortified as it was opulent and ornate. The imperial emblem adopted for the dynasty was the Elephant which signified might and grace, as also being aligned to the King’s name. Hasti in Sanskrit meant ‘Elephant’ and therefore the city which King Hasti founded started to be known as ‘Hastinapuram’ (or ‘The Elephant City’ as ‘puram’ in Sanskrit meant city). Later the place came to be popularly known and called as Hastinapur. After King Hasti, the next most powerful and famous king to rule the Paurava kingdom was Kuru, who ascended the throne at Hastinapur four royal generations after Hasti. The Paurava dynasty thereafter has been referred to as Kuru’s dynasty and lineage, as Kuru is said to be the mightiest and the most illustrious king in the lineage. His kingdom was called the Kuru rashtra and his clan or descendants the Kauravas. It was only in the age of the Mahabharata that the Pandava line emerged from the Kaurava dynasty and was named after King Pandu. The story of Mahabharata primarily begins with King Shantanu, who is the thirteenth in the royal lineage and ascendency to the Hastinapur throne, after Kuru. King Shantanu’s eldest son Devavrat (better known as Bheeshma) gave up his claim to the Hastinapur throne in favour of his half-brothers Vichitra Virya and Chitrangad, and vowed to forever protect the throne and the kingdom of Hastinapur. It is from this line of the Kuru kings that we have the later heroes of the Mahabharat, King Dhritarashtra, King Pandu and their respective descendants who called themselves the Kauravas and Pandavas respectively. At the time of the Mahabharata era, Hastinapur was undoubtedly the most powerful and opulent city in entire Aryavarta and the Kuru kingdom was the most extensive. Led by Devavrat, a proficient warrior and leader par-excellence, most of the neighbouring kingdoms across North India were subjugated to the power of the Kaurava King and owed their allegiance to Hastinapur. However, not all kingdoms were brought under subjugation by war by the Kauravas, but friendly ties and matrimonial alliances as well. The legends of the abduction of the princesses of Kashi (Benaras), Amba, Ambika and Ambalika by Devavrat and the subsequent marriage of Ambika and Ambalika to Vichitra Virya and Chitrangad; the marriage of the blind Dhritarashtra to Gandhari, the princess of the north-west kingdom of Gandhara; or the marriage of Kunti, adopted daughter of King Kunti-Bhoja in the Yaduvanshi line of the Bhoja kingdom in far west, are popular and well known in the Mahabharata and its related stories. It is also mentioned in the Mahabharata and the Puranas that though many kings desired to rule over a grand and wealthy city like Hastinapur, no king in Aryavarta had the might to rage war against the Kauravas; and that the destruction of the Kauravas was brought about by their own feud and internal hostilities, is again well established. Many have often thought that the imperial capital of the Kauravas, Hastinapur, was destroyed in the Mahabharata war as all the Kauravas were killed and the clan ended. Such is not the case as Hastinapur is said to have lived on for at least thirteen more generations after the Mahabharata before it was destroyed. The lineage left behind by Arjuna, however continued for twenty seven more royal generations after the Pandavas, though they were called the Kuru-vansh (lineage) kings once again (and not the Pandavas). At the end of the Mahabharata war at Kurukshetra, with the Kaurava clan being erased and Hastinapur being won over by the Pandavas, the eldest Pandava Yudhisthir ascended the throne at Hastinapur with queen Draupadi. While they had ensured that the Kaurava clan was completely decimated in the war, the Kauravas had also left no stone unturned in meting out the same treatment to the Pandavas. All their sons had been killed in the war and the only one left in the lineage was the un-born Parikshit, grandson of Arjuna, who was ensconced safely in his mother Uttara’s womb. Legend has it that after the Kaurava princes and stalwarts had trapped and killed Arjuna’s son Abhimanyu in the fatal ‘chakravyuh’, Duryodhan had wanted to even kill the un-born Parikshit in his mother’s womb, but Yudhisthir had miraculously protected and saved him. So when the dejected Pandavas decided to retire from the world, which was soon after Krishna’s departure and the advent of Kali Yuga, they placed their only heir to the lineage, young Parikshit, on the throne of Hastinapur and departed from the kingdom towards the Himalayas. The first two kings of Hastinapur during the immediate Kaliyuga, were of notable fame: Parikshit, who worked towards consolidation of the broken empire and rebuilding Hastinapur to a large extent; and his son Janmejaya who continued the work started by his father. It is also said that while wandering in the north-west regions of Aryavarta, King Janmejaya met sage Vaisampayan (son of the great sage Ved Vyas) at the location of Taxila (present day north Pakistan), who narrated to him the detailed story of his ancestors, which Janmejaya later recorded with the sage’s permission. This is said to be one of the first written sources of the epic Mahabharata. However, the later kings of Hastinapur failed to hold on to their empire or to the might and influence of Hastinapur and gradually the kingdom and its capital fell in its significance. It was during the reign of King Nichakshu, estimated around 900 BC, that a great deluge hit Hastinapur as the Ganga suddenly swelled and rose in mighty force. The ancient texts, Matsya and Vayu Puranas, describe this tremendous deluge lashing upon Hastinapur as “swirling water columns of great force, risen to the perpendicular height of thirty feet bore away all within its sweep, thus lying Hastinapur to its ruin.” Post the deluge, the Ganga River moved its course away to its present location and left the city of Hastinapur completely submerged in silt and mud up to the height of a few storeys. Such was the destruction of this once grand and imperial city that the place was deserted and was not lived in by people for next few centuries. Later excavations and the inspection of the soil in Hastinapur region validate the great flood that is attributed to the destruction of the mythological city of Hastinapur. The Kuru king Nichakshu left the place with his surviving people and moved his kingdom to Kaushambi, located 50 kms from modern day Allahabad. The Kuru lineage set up their new kingdom and continued to rule from Kaushambi for another fourteen generations, till they were decimated in territorial wars during the later Vedic period, at the time of King Kshemaka the last Kuru ruler. Mythology estimates that the time-period from Parikshit to the end of the Kuru line is 1050 years. It was almost towards the end of the later Vedic period that the region of Hastinapur started getting populated again. However, the place remained insignificant and its lost glory was never revived again. In later eras, some temples and structures were built in remembrance of the Mahabharata history and its heroes, in the region and it became a centre for Hindus to visit and reminiscence the mythological legends. Samrat Samprati, the grandson of Asoka is believed to have built quite a few temples in this region, but those had later fallen into ruin or have been destroyed. During the onset of the Mughal Empire in India, Hastinapur was invaded by Babur. Later during the British Raj period, the region of Hastinapur was ruled over by the local Gujjar king Raja Nain Singh Nagar, who has been credited with noteworthy efforts of restoration of some of the ancient temples. Hastinapur today, though stands as a small town and ‘nagar panchayat’ in the Meerut district of Uttar Pradesh, still reminds us of its revered history and heritage of the Mahabharata era, and is one of the few ancient places in India which can be traced back to pre-mythological times. I am participating in the #BlogchatterA2Z challenge and today’s letter is ‘H’. Hi Neha.. thanks for your comments and for reading the post! Stay tuned for more exciting cities as we travel up to Z ! You're very knowledgeable. I now have a good deal of information about Hastinapur. Thank you Kalpana, I am happy that you liked reading my post on Hastinapur. I am passionate about history and mythology and feel privileged that I am able to write these posts on the subject. Thank you Jai for your encouraging comments and glad that you liked the post on Hastinapur! I shall read your post and leave my comments. A very detailed post about Hastinapur with its history in the era of Mahabharata and now. Eager to which city you are going to unravel, Sayan. Thank you Rohan for your comments! Stay tuned for more such exciting stories about our ancient cities, as we travel up to Z ! Very well written. I am glad we would be much more enlightened about our country's rich heritage by the end of this Blogging challenge. Everytime I read your posts, my interest for history and mythology is increasing. Very well written. Thank you Sushma.. am happy that my posts are inspiring you to take interest in history and mythology! 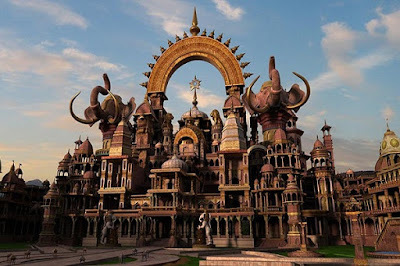 Was aware of a few things about Hastinapur, but your detailed post, added more insights and information. Thanks for sharing, Sayan! Thanks Shilpa.. Glad that you liked the post and found it an interesting read. The first thought that pops into my head is 'How the mighty have fallen!' Men, women, civilizations, city none are exempt. This is such a fascinating series. Keep up the great job, Sayan. Thank you Varad for your ever-inspiring comments :) Yes, indeed.. such is the power of time and the cycle of fortune.. no one can escape it! Hi Sayan, have you ever visited these places in North (UP)? Parikshit is quite a familiar name is all Brahmin families of East UP as Parikshit was the one who organized a great Yajna for the deliverance of his ancestors. We also recite Bhagwat Katha which is a narration of all Vishnu awtars. Shukdev ji, Vyasji's son, recited it to the dying King Parikshit, and it is believed that who listens to all the stories gets the Salvation. Hi Shipra.. thanks for your comments. Yes, I have visited some of these places during my stay in Delhi for 3 years. I have heard and read about the legends around Parikshit and his yajna. He is credited with the resurrection of Hastinapur after the destruction caused in the Kurukshetra war and is known to have been a devoted and righteous king. The Bhagwat katha recitals are quite famous in the north.. I have heard about them but never had the chance to attend one. Great to see you adding such notes in your comments, which also enriches my knowledge. Our mythology is so vast and often so ambiguous, that it is difficult to concise it in topical articles! The story of Mahabharatha was known but post that there was so much knowledge i gained from here. Keep going! Thanks Sudha.. my endeavour has always been to write about the lesser known stories as people would mostly know all the popular stuff.. Happy that you liked reading the post! Finally a place on your list at least I knew a little bit about 😊, this was on a lighter note Sayan. Brilliant series and some great compilation here! That's nice to hear Roma.. thank you for your appreciative comments! And yes, you may spot a few places you know in my forthcoming posts too, as I am going to write about some popular cities ! What a beautiful combination of history and mythology Sayan. While Hastinapur was introduced to most of us through Mahabharata serial, it is refreshing to read the detailed story associated with the city. Way to go Sayan. Thank you Sonia.. your mention of the Mahabharata serial brought back nostalgia.. I used to enjoy that as a kid, and guess my interest in history and mythology started from there or abouts! Happy that you liked reading the post.. I must appreciate your knowledge, Sayan. At least I have gained much knowknowledge (the stories of Mahabharata, which are unknown to me) from your post.It's really great to know that. Hey Sayanti.. thank you for your appreciation! I am happy that you enjoyed reading my post and found it informative:) I have visited your posts too and left my comments..